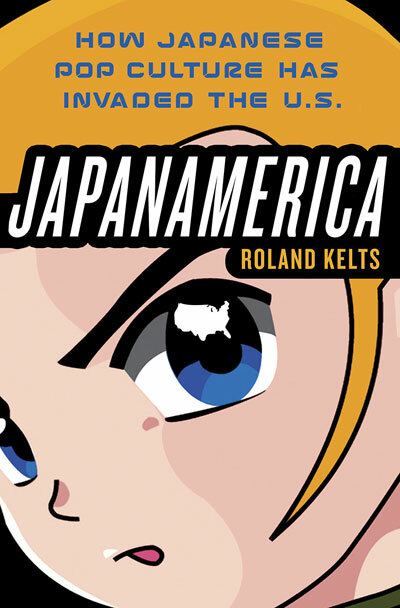 DWT friend and all-round good-egg Roland Kelts has a new book out about the bizarre and intriguing bonds between the cultures of Japan and the US. Japanamerica touches on everything from manga to maniacs, so read on to hear what Roland has to say for himself. PS If you’re in Tokyo, don’t miss the chance to get it straight from the horse’s mouth tomorrow night - details at the end. The Mobius strip metaphor I use in Japanamerica to illustrate the interrelated popular cultures of Japan and the United States has proven among its most useful. Since the book’s publication, bookstore and lecture hall audiences, journalists and social critics, professors and students, otaku fanatics and interested readers alike have embraced the image as a way of understanding a bicultural relationship of increasing intimacy and mutual awareness. And if you can imagine the strip in motion - whirling through the winds of the Pacific and DSL, cable and satellite TV signals, criss-crossing the 50 states and beyond - you will get a clearer picture of what is happening now: It is tying the two countries ever closer together. The father of anime and manga, Osamu Tezuka, idolized and imitated American artists Walt Disney and Max Fleischer some sixty years ago. Today, as I write, the first major exhibition of Tezuka’s protean illustrations, The Marvel of Manga, is on display at San Francisco’s Asian Art Museum - installed simultaneously with an exhibit of master Taisho Yoshimoto’s Edo- and Meiji-era woodblock (ukiyoe) prints just down the hall. So-called “high” and “low” Japanese arts are colliding under one American roof, and Tezuka, long considered a genius and cultural icon in Japan, is suddenly and finally making headlines in a country whose artists first inspired him, and whose bombs helped shape his dedication to peace. 350 or so miles to the south, in the heart of Los Angeles, the crack animators and computer graphics artists of Imagi Animation Studios International, with offices in LA, Tokyo and Hong Kong, are crafting a feature-length film of Astro Boy, Tezuka’s signature creation, for release in American and Japanese cinemas in 2009. They are working directly with Tezuka’s posthumous studio, Tezuka Productions, whose chief spokesperson, Yoshihiro Shimizu, is directly involved in the project - and who graces these pages with his insights and reflections. The very same studio, Imagi, is hard at work on another American feature film, Gatchaman, the very title that kicks off Japanamerica via an interview with Sandy Frank - the NBC producer who brought anime to America in the late 1970s, when he purchased and radically redrafted Gatchaman into the now retro-classic, Battle of the Planets. Imagi plans to release Gatchaman in 2008. A sign of the Mobius strip: They will not title their film Battle of the Planets. They will use the original Japanese title, Gatchaman, because that is what it is called, and that is what Americans want today - the original Japan, raw, unfiltered, unaltered, un-hyped. The number of cross-cultural projects currently afoot is hard to account for, but it’s worth mentioning the Steven Spielberg/Michael Bay version of Transformers, based on Japan’s Takara toys and subsequent anime series and out next month; the Wachowski Brothers’ (creators of the anime-homage Matrix films) forthcoming 2008 version of Speed Racer, to which both Christina Ricci and Susan Sarandon have committed, based on the manga and TV series Mach Go Go, created by the Yoshida brothers (who also gave us Gatchaman in the 1960s) and excerpted in the 2005 Geico car insurance TV ad campaign; and Titanic titan James Cameron’s Battle Angel, due in 2009 and based on the manga series Battle Angel Alita created by Yukito Kishiro in 1991. Kelts and contributing writer Leo Lewis will gave a presentation based on Japanamerica on Tuesday, June 26, beginning at 6:30 p.m., as part of the Foreign Correspondent’s Club of Japan’s “Book Break” series. The evening includes an opening dinner with the authors. Reservations are required; complete information is here.